Cousineau Wood Products is located on a 65 acre lot in North Anson, Maine. 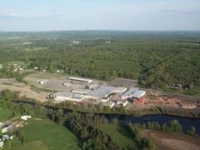 The facility consists of a state of the art sawmill, log yard, value-added manufacturing space and plenty of available storage / warehouse space currently available for lease. The Cousineau family has been in business for over 50 years providing quality wood products at reasonable prices. In recent years the company has started specializing in value added re-manufacturing. They are turning their hardwood lumber into many different value added products like gun stocks, rolling pins, duck calls, paddles, baseball bats and many more.